After Laura Parr marries Baron, Lord Nathaniel Lanyon, he takes her to live in his ancient home in Cornwall. A dark cloud hovers over Wolfram. The death of Nathaniel’s first wife has never been solved, and some of the villagers believe him responsible. Struggling to understand the distant man she married, Laura tries to uncover the truth. With each stone unturned, she comes closer to danger. Lord Nathaniel Lanyon had decided never to marry again. But when he meets Miss Laura Parr, the daughter of Sir Edmund Parr, one rainy afternoon, he realizes almost immediately that he must have her in his life. And the only way he could was to marry her. Nathaniel believes that his troubled past is behind him and he can offer Laura a good life at Wolfram. However, he knows he can never offer her his heart. But as soon as they come to live in the ancient abbey, the past returns to haunt him, revealing secrets that he thought had been buried forever. When twenty-two-year-old Laura Parr meets thirty-two-year old Nathaniel, Lord Lanyon, a baron with a troubled past, in summer, 1899 he reminds her of Heathcliffe, a character from Wuthering Heights. The hackney carriage they share is involved in an accident. “Really, I don’t think this is necessary,” Laura protested when he lifted” her into his arms and carried her across the road. “And she a strapping female, who prided herself on being athletic and strong” whose father, a member of parliament, allowed her to attend lectures at university. Interested in women’s rights she does not want to marry, instead she plans to find employment and move into a flat in Bloomsbury. Nathaniel, a widower whose wife died in mysterious circumstances, is confident of Laura’s passionate nature. “It was evident in the flash of her beautiful green eyes and her wilful mouth that he wanted badly to kiss but for a young lady as gently reared as her it could only mean marriage.” Nathanial woos her, tells her his wife would be “his partner in life”, weds her and takes her to Wolfram Abbey his country seat in Cornwall. From the beginning of this spine-chilling Gothic Novel, with beautiful word pictures of Cornwall, the author skilfully creates fear and suspicion. The twist at the end is a fiendishly clever one which I did not anticipate. 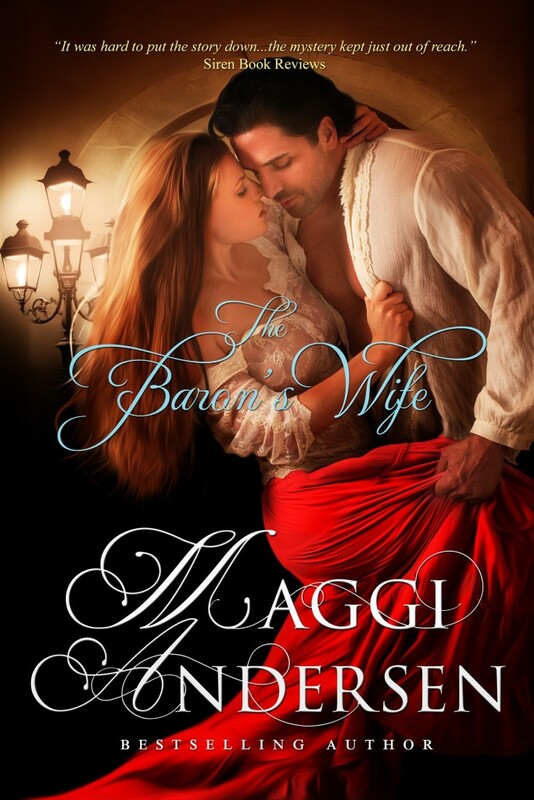 The Baron’s Wife deserves the five stars I have awarded it. A Gothic romance in the classic style, the author is a master at creating ominous atmosphere and multilayered characters.” Coffee Time Romance and More. “A Gothic romance in the classic style, the author is a master at creating ominous atmosphere and multilayered characters.” Coffee Time Romance and More. “The plot was interesting and the added mystery kept me riveted. The novel kept me wondering until the end.” The Romance Studios. “It was hard to put the story down as the mystery kept just out of reach, drawing the reader in further to the storyline. [It] kept me up way too late into the night following the puzzle of Wolfram Abbey. I look forward to seeing more from Maggi Andersen.” Siren Book Reviews.